I've been thinking about fiber beads. It all started when I say some wonderful stringy beads on the front page of Etsy. I clicked and admired the artist' beads. Over the next week or two, I found myself looking at a variety of beads and wondering about their practicality. How well do they hold up ... okay, a necklace might be one thing, but how about bracelets, their use as buttons, etc. etc. etc. 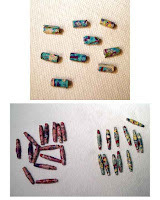 Then, out of curiosity, I started doing searches on Etsy and Artfire to see how these beads were being used in end products. And, MUCH TO MY SURPRISE, found very little useage of them. SO, what are the folks that buy these beads using them for ??? I know they are pretty, but can't imagine they are just sitting around in bowls as coffee table decorations. I belong to the Artfire Fiber Arts Group and posted an inquiry in the forum asking if there were any bead makers and if so, what did their customers use the beads for .... not the felt beads, but those wonderful fiber ones. I didn't get any answers, but one of the artists, Unique by Karlee, told me about how her grandmother use to occupy them for hours making beads out of wallpaper and she was going to try to make some beads using some of her fabrics. So ... off I went to try my hand at beads with the painted canvas. 1st set: Cut 1/2" x 2" pieces. Smeared up the blank side with E6000 and wound them up on a coffee straw. The E6000 is quite toxic and believe I was abit high before done. I wouldn't say it is a great adhesive for these ... the canvas is just too heavy ... the ends did not stay closely set against the bead. 2nd set: For these, cut the canvas strips at 2" x 3/4". Decided to try the high tack adhesive spray. Layed them out, blank side up and sprayed. Again, rolled them up on the coffee stirrer. WOW ... is this adhesive every tacky. It is so tacky that I had alot of trouble getting my fingers off the canvas. Had to stop a couple times and soak them in a little finger polish remover to get the sticky off. But, it works much better than the E6000. 3rd set: I found myself thinking about my old 'favorite' adhesive from the mosaic days ... clear acrylic caulk. Broke out a tube. Cut canvas strips the same as set two and smeared a thin layer of the caulk on the blank side. This time, rolled them up on a piece of 16 gauge wire .. for a smaller hole opening. Worked wonderfully !!! Now, these beads are certainly not those wonderful fibery art pieces I saw on Etsy, but these are pretty cool looking and I think I might try them on a bracelet soon.